Lecture: "Spiritual Reportage: Christian Literature in China"
The avant-garde writer Bei Cun 北村 (1965-) is one of many Chinese intellectuals who have turned to Christianity in recent years. The Baptizing River 施洗的河 is the first work he published after his conversion. A psychosocial biography of its anti-hero Liu Lang set in the 1940s, the novel follows the protagonist from a beleaguered childhood to sexual awakening and self-loathing at university, through a business career in illegal commodities, to apathy and addiction in middle age—and on to his “baptism” in the penultimate chapter of the novel. Chinese critics have hailed the novel for its interiority and depiction of a spiritual life, as well as its critical reflection on society, vice and evil—but does this “spiritual reportage literature” stand up to literary and theological scrutiny? And where do the writings of Christian intellectuals sit in the broader spectrum of Chinese theology and church growth? 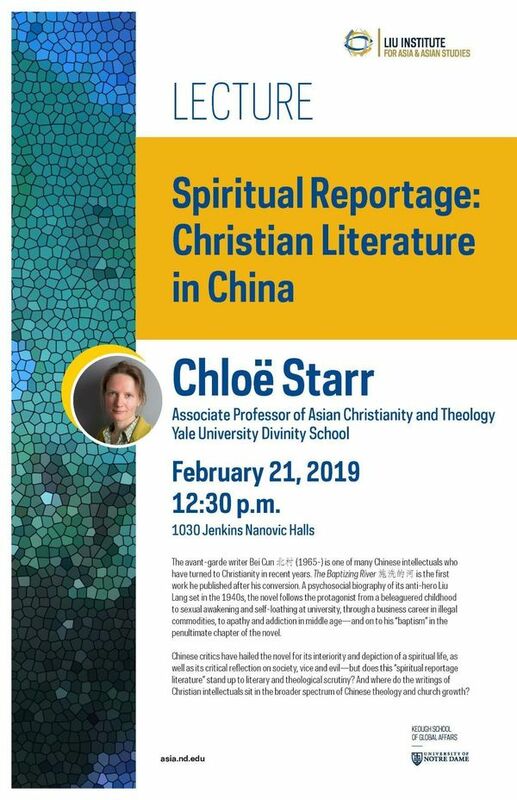 Chloë Starr is Associate Professor of Asian Christianity and Theology at Yale University Divinity School. Originally trained in classical Chinese literature, she works on late imperial and contemporary Chinese theologies and at the theology/literature boundary. She is the author of Chinese Theology: Text and Context (Yale University Press, 2016) and of Red-Light Novels of the Late Qing (Brill, 2007), editor of Reading Christian Scriptures in China (T & T Clark, 2008), and the co-editor of The Quest for Gentility in China (Routledge, 2007) and Documenting China: A Reader in Seminal Twentieth-Century Texts (University of Washington Press, 2011). She is currently writing a volume on Chinese Christian fiction and translating an anthology of Chinese theology.